Allgemeines Künstlerlexikon: Bio-bibliographischer Index A–Z = The Artists of the World : Bio-bibliographical Index = Encyclopédie Universelle des Artistes: Index Bio-bibliographique = Enciclopedia Universale degli Artisti: Indice Bio-bibliografico = Enciclopedia Universal de los Artistas: Indice Bio-bibliográfico. Munich: K. G. Saur, 1999– . Index to biographical encyclopedias and dictionaries on artists. Entries include artist's name, birth and death dates where known, nationality, and references to entries in biographical sources listed in the front of each volume. The most comprehensive and wide-ranging index to artistic biography available. Mason, Lauris, ed. Old Master Print References: A Selected Bibliography. White Plains, NY: Kraus International Publications, 1986. References to the work of 900+ Old Master printmakers. Citations include catalogs raisonnés, checklists, articles in periodicals, listings in multivolume indices, and museum, dealer, and exhibition catalogs, from earliest published work to 1984. Entries include the artist's name and birth and death dates, followed by citations organized by publication date. For each foreign title, an English translation is given. Mason, Lauris, and Joan Ludman. Print Reference Sources: A Selected Bibliography, 18th–20th Centuries, 2nd ed. Millwood, NY: KTO Press, 1979. Provides bibliographical references on printmakers of the 18th through the 20th centuries. Printmakers are listed alphabetically; citations for each are listed chronologically. For each artist, birth and death dates where known (and if not known, the century in which the artist lived) are given. Citations include catalogs raisonnés, oeuvre-catalogs, museum and dealer publications, and checklists and essays from books and periodicals. Some references to unpublished material are also included, with the title and projected publication date. In cases where information about an artist is scarce, references include listings in group exhibitions, general books, and articles. Some publications are rare and difficult to locate. Toyokuni Utagawa. 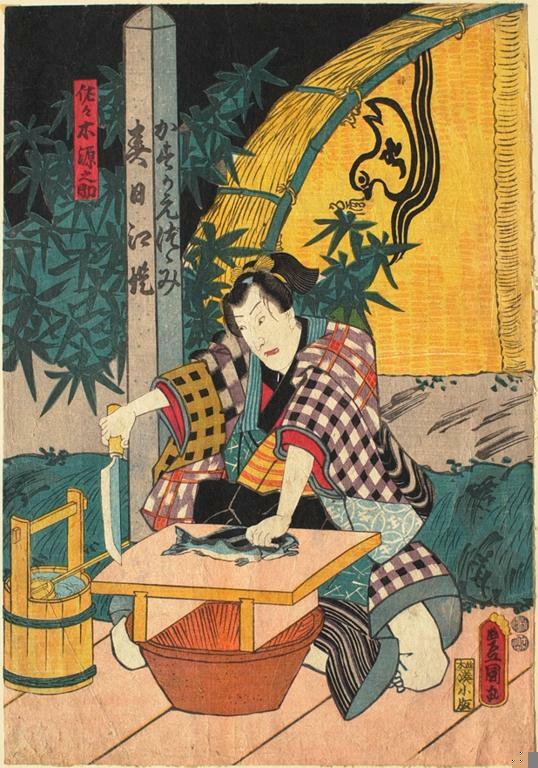 Scene from a Kabuki Play (Actor Making Sashimi). Color woodcut, 1800-1864. Sterling and Francine Clark Art Institute, Williamstown, Mass.